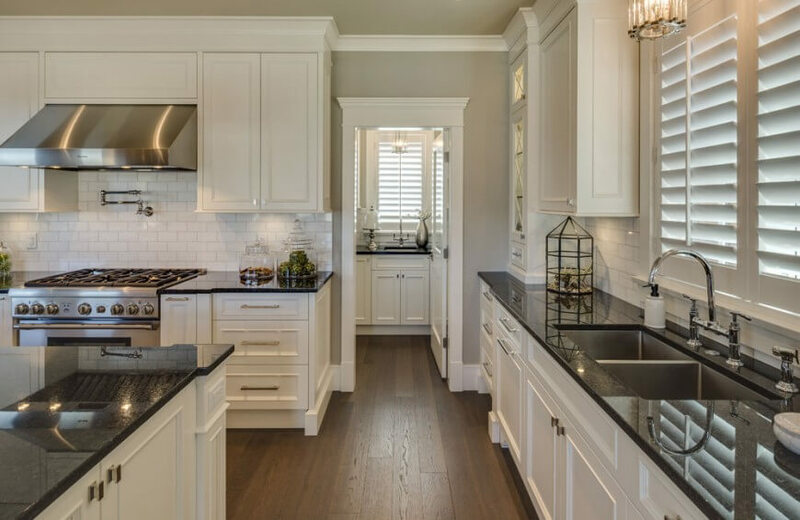 Welcome to our gallery consisting of photos from the New Westminster project house designed by Clay Construction. 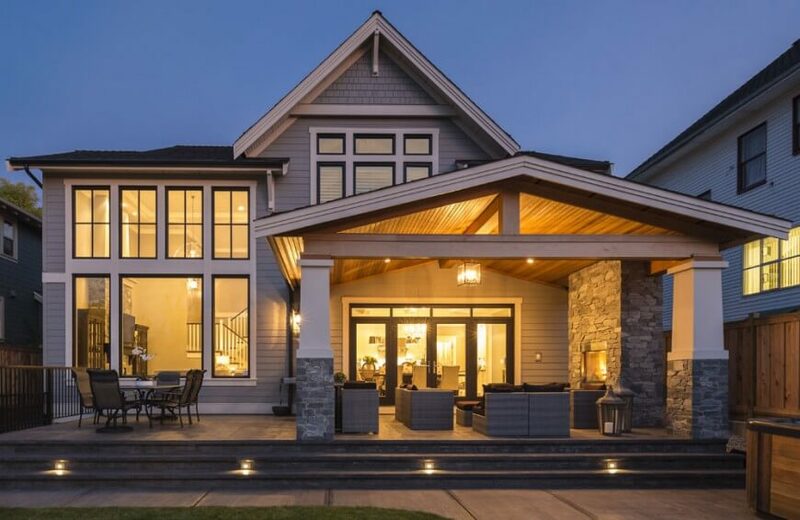 Based in British Columbia, Clay Construction prides itself on ten years of experience with building custom homes and home renovation with excellent customer satisfaction. 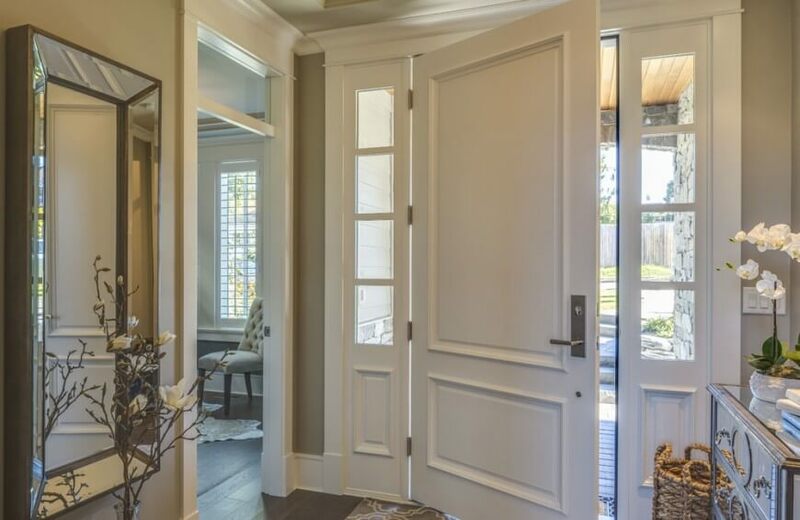 No matter what project you have in mind, Clay Construction provides service from the infancy of your project to the final walk-through. Communication is key, and customers receive detailed financial information every step of the way. 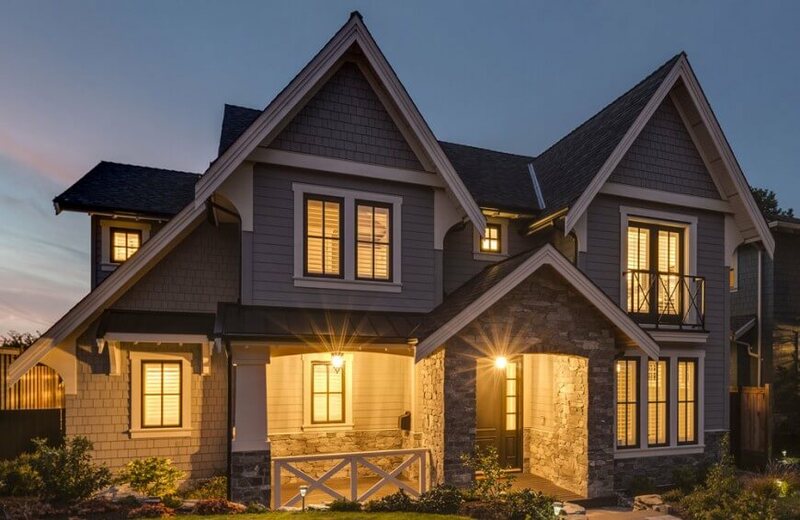 This project is a prime example of the level of craftsmanship Clay Construction provides its clients, from the unique floor plan to the design work on the interior of the home. A primarily contemporary style home, the rooms have small touches of other styles in them. Some have sleek, modern surfaces. Others embrace more traditional decor, but a bright and airy color palette flows throughout, providing a sense of cohesion. 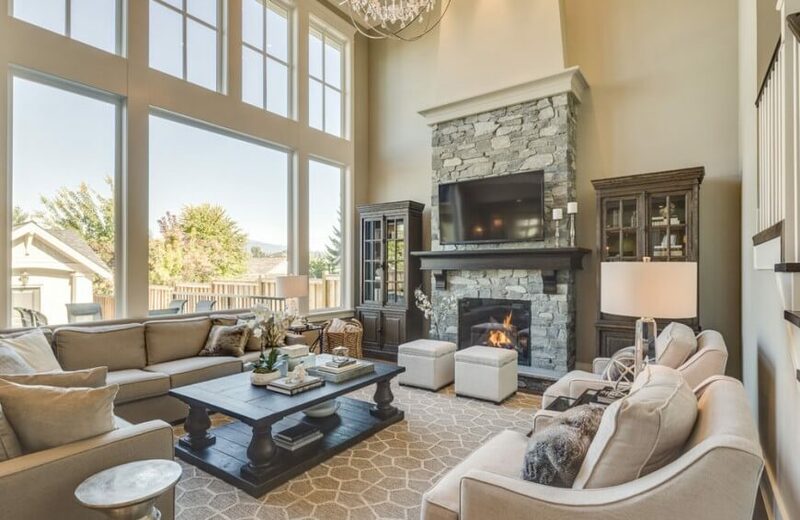 By taking details from one room and adding them to another, like the stone fireplace from the living room that matches the fireplace on the covered patio, this home feels wonderfully livable, open and cheerful. 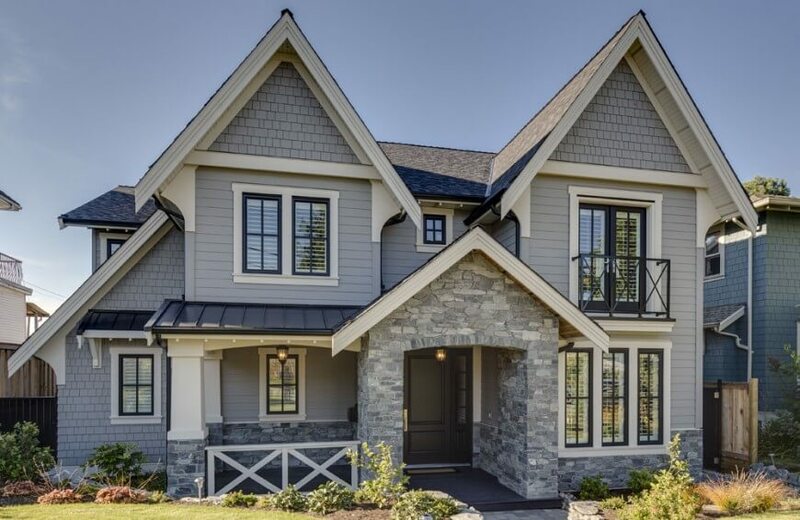 Custom home in New Westminster, British Columbia by Clay Construction (has great curb appeal for a quasi-urban setting). A nighttime view of the front entryway to the home, showcasing the simple and elegant landscaping. 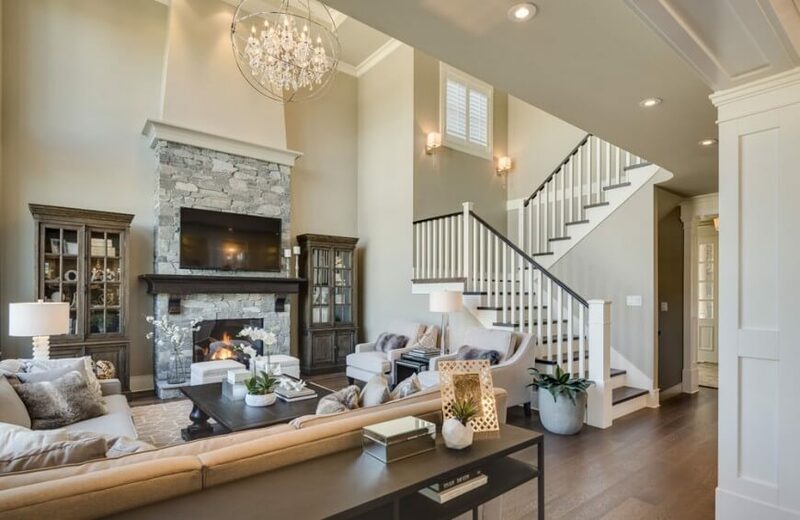 A small foyer leads into the room to the left, a home office, and back to the main living area. A close-up view of the eat-in kitchen with an enormous granite island. 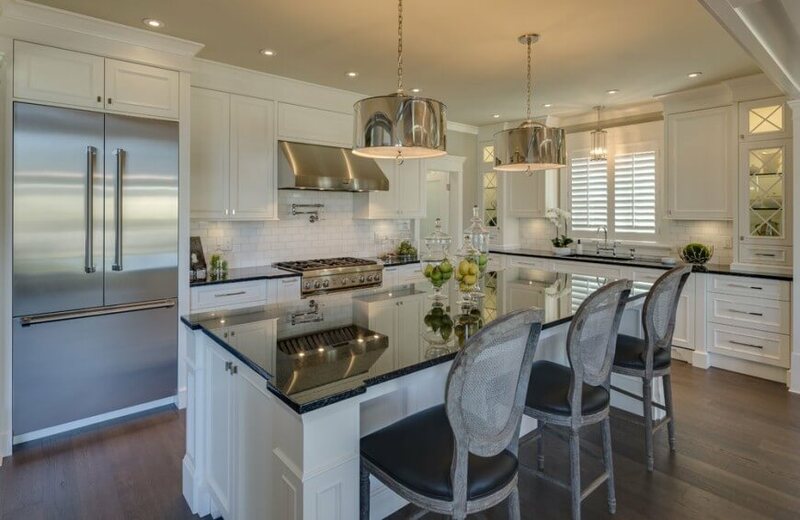 Stainless steel appliances are complemented by the pendant lighting above the island. From this angle, we can see the white backsplash in the sink and cooking areas. 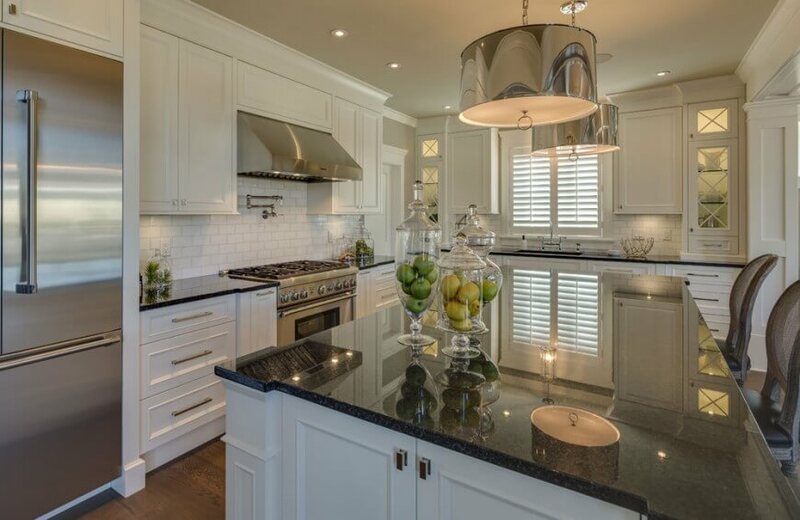 Glass-front cabinets on either side of the far wall add visual interest. A small washroom comes off the side of the kitchen. The kitchen opens up into the dining room, which features a large plank table and cushy seating for eight. A coffered ceiling differentiates the rooms. The view from the edge of the dining room shows the hardwood staircase leading upstairs and the foyer. 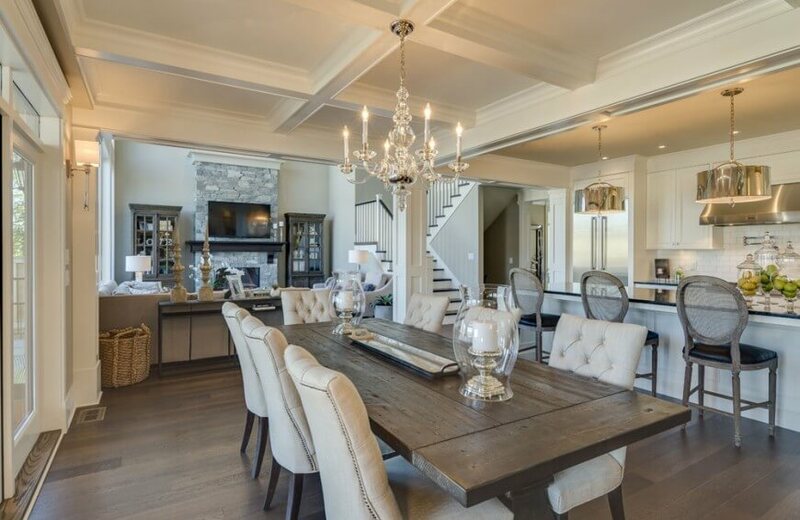 The crystal orb chandelier adds a modern twist to the traditional chandelier. 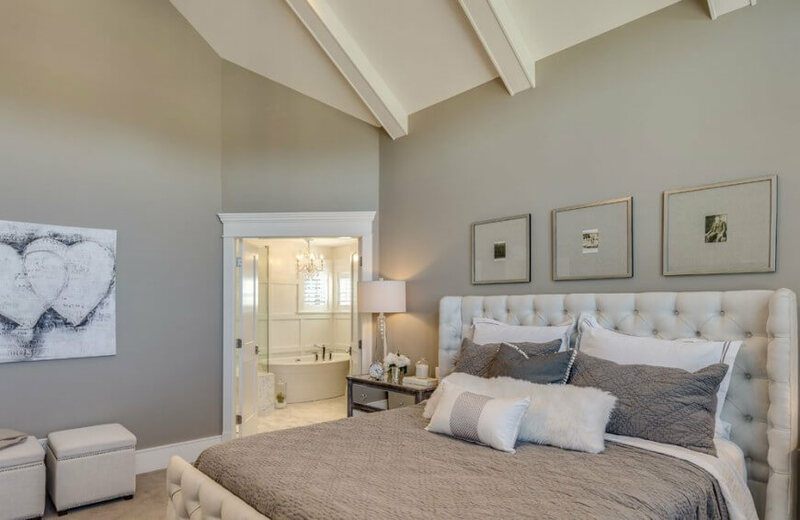 The upstairs master bedroom has an on-suite bathroom and a cool, neutral color palette. A trio of old photographs top the plush quilted bed frame. The master bathroom has a large stone and tile glass-enclosed shower stall, complete with a bench. 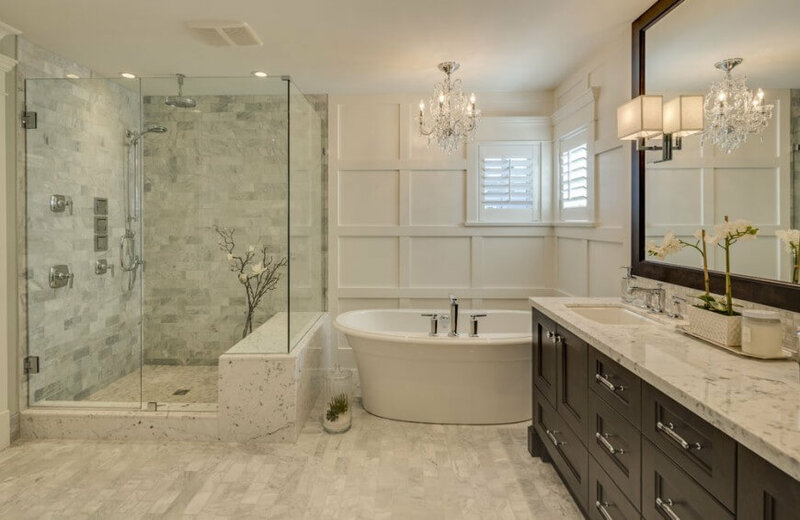 A small chandelier hangs above the large soaking tub. The dark-wood vanity is topped with marble. 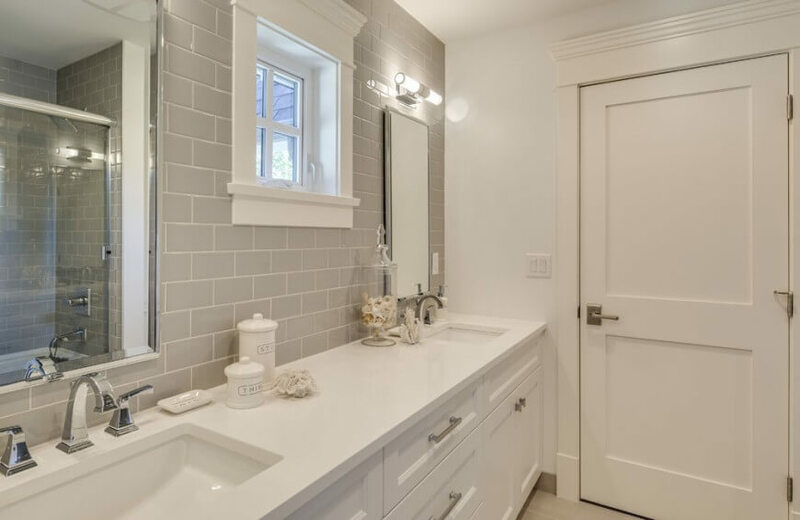 The guest bathroom is primarily white with his-and-hers sinks. The grey tile backsplash extends into the shower and tub enclosure. 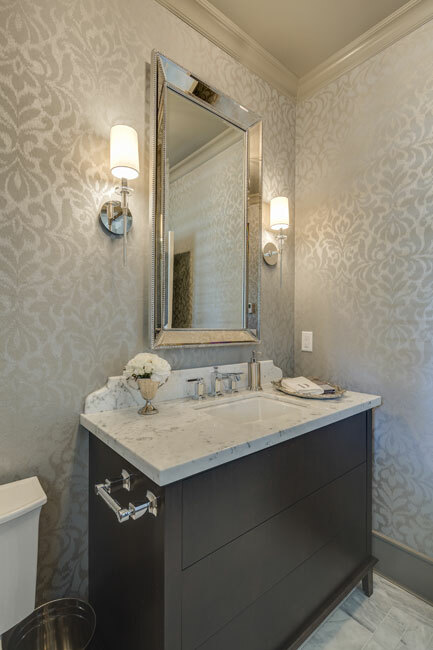 A small half-bath downstairs is dressed up with chic wallpaper and sleek dark wood vanity. 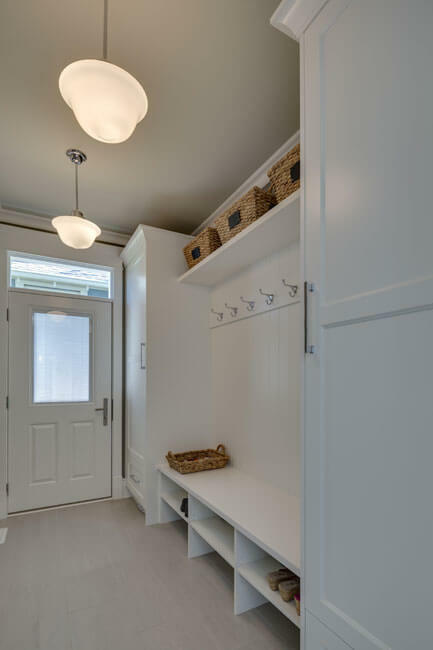 An all-white mudroom with plenty of storage options; lockers, hooks, and above-and-beneath the bench shelving. The backyard is built for entertainment. The covered section of the patio includes a stone fireplace similar to the one in the living room. A secondary dining area on the uncovered section ensures plenty of seating. This straight-on view of the back of the house shows the large glass windows and provides a peek of the hot tub to the right.